We're feeling a little punchy tonight: it's the end of Spring Break and we enjoyed a staycation. Which is to say we searched desperately for free or low cost things to do each day with three kids of varying ages (8, 5 and 2). Anyhoo, tonight's meal was stir fry whipped up at home and supplemented with delicious potstickers from Thornton's own Heaven Dragon. Plus: gigantic slices of navel oranges. Bring on that weekend! 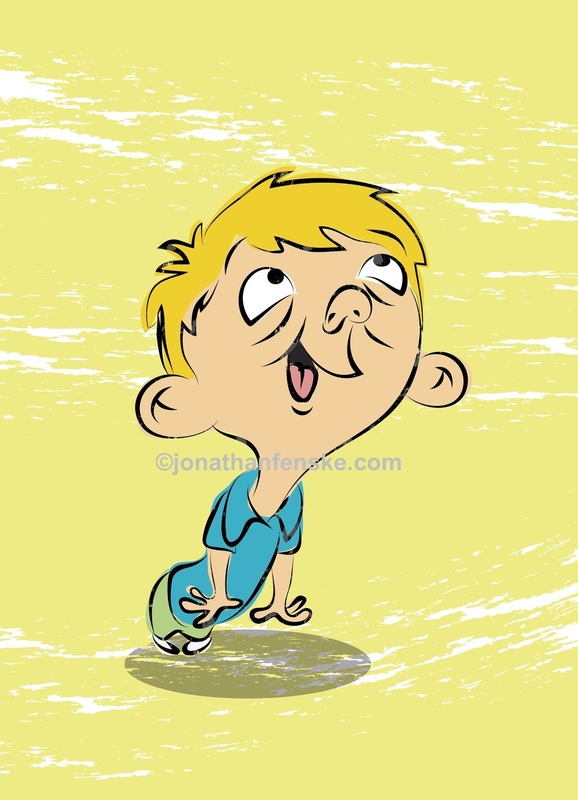 Here's a cute illustration from Jonathan's latest picture book project called STUFF. He's been working on this character this week and he says he's finally there. Have a great weekend, ya'll! And thanks for stopping by. We painted our family room and kitchen (they are one continuous room) a seedling green in 2007. I was into gradients back then, so the color in the family room was lighter and the kitchen was a darker version of the green. I liked the color for years, but lately, I knew I wanted to go gray. At first, I was thinking a dark gray but Jonathan said that would be like living in a storm cloud in the most used room in our house. I knew he was right, so I went on the hunt for the perfect gray. Sadly for the gray color chips of the world, I was asking a lot. I needed the Perfect Gray to be smart, sophisticated, not purple, not blue-gray, unassuming, farm house honest, city loft cool, reassuring, a little brash, not too arrogant and neutrally neutral. That's not too much to ask out of a gallon of paint, right? I have a bad habit of picking a paint off of a swatch, painting a room and later ending up hating it. So, this time around, I knew I needed to pony up a little money for paint samples. I headed to Lowes with three kids in tow. I poured over a lot of paint cards while piloting one of those ridiculous race car carts. The girls were their usual rambunctious selves, so I just threw fruit snacks at them from time to time. Luckily, Lowes is huge, so my children were able to blend in a little bit more. Not so much at Benjamin Moore. It's a standalone store, and since I wanted to see their colors (I'd never used them, but had heard good things about their paint on Young House Love), we headed over there. I met the coolest mom who was also looking for her perfect gray, so we bonded over that while her girls played with mine. Sadly, my loud, boisterous and hungry children (it was near lunchtime) were a little much for the staff there, so we made a hasty retreat after I paid for two paint samples. Now that I've gone the paint sample route, I have to say I will always do it this way. A sample is $2.98 and I ended up purchasing a total of four. The samples at Lowes are larger, but even Benjamin Moore's smaller samples give you enough to paint a huge section of wall if you want to. The pattern thingie at right is our hanging panels over the sliding glass door. At first, I was sure Gray Horse was my dream color. But then I remembered Jonathan's storm cloud warning. I think he was right---it would be too dark. So then I fell in love with Silver Spoon because I felt it gave the the punch I wanted. I painted Silver Spoon everywhere. And then I returned to it over and over, like a hopeful lover. We had to be together, right? Alas, it was not to be. Silver Spoon was, well, kind of a Purple Spoon. And I knew if the wall looked purple, I would despise it with a white-hot fury. So, I turned to Moonshine and you know what? It is a genius paint color. Absolutely perfect. Really. I first read about it on Young House Love and didn't think it would work because we have trim that's a warm putty, not white like YHL 's John and Sherry. Their Moonshine pops with that white trim. But Moonshine being the lovely lover that it is...well, it did the trick. And I do feel more sophisticated. And about five pounds thinner. This is some paint, I have to tell you. Here's the week's most unflattering picture. And this is the best painting pic we have. Egad. I love, love, love this gray! For the record, we color-matched Moonshine by Benjamin Moore to Olympic's Premium No VOC in satin. I have painted a lot over the years, and I have to tell you, this paint doesn't smell at all. There is zero odor or "new paint smell." As a mom of three small children, I blow kisses to Olympic. It's like we never painted. But oh, yes, we did. The kitchen picture looks a little shiny...I think I took the pic when the walls were still wet. So, I'm really happy with our new gray. I've also been busy grabbing a few things here and there, stretching my makeover budget. I bought pillows and baskets for throws at HomeGoods. Oh dear, I love me some HomeGoods. We're getting there! Little by little. Can't wait to show you the shelves...I'm over the moon about them. Love how they turned out. We're Jennifer (novelist, mom, blogger) and Jonathan (children's book author/illustrator, dad, runner and artist). We also have a line of affordable modern art canvases for children. Thanks for stopping by!